Services: photo shoot direction, web design. “Working with Curious was a complete pleasure from start to finish. From our first meeting I was confident we had made the right choice. We needed to create a professional website but we very much wanted it to have a very definite design that embodied the atmosphere of our practice. Curious understood immediately what we wanted. They had both the flair and the practical knowledge to create a website that we are really pleased with and proud of. It also works extremely well. The girls made it all very easy, in fact enjoyable. 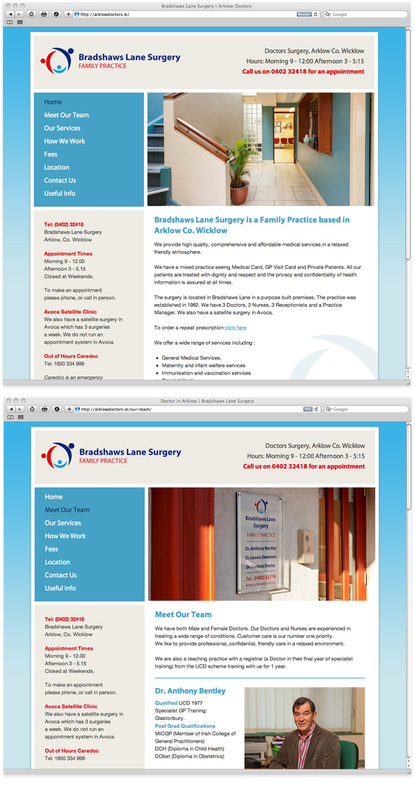 Bradshaw’s Lane Surgery is based in Arklow Co. Wicklow, it has a friendly team of three GPs and two nurses. The practice is very much focused on customer care. The surgery has been purpose built with patient comfort as the number one priority. The team required a website to showcase the bright airy and comfortable surgery, while also providing practical information to existing and new patients. We worked closely with Helen and her team over the course of the project in order to get a true feel for day to day life in the practice. Together we planned and styled a photo-shoot to capture the atmosphere of the surgery. The photography became the main focus of the site so that new and existing patients feel comfortable in a familiar environment when they visit.